I counted each turn as 1 rep so technically I only did 22 planks with each leg!!! And, Stacy and I are fixing to head out for another freezing cold 8 mile run!!! (21 degrees) I don’t know how some of y’all do this every day – the cold is miserable!!! 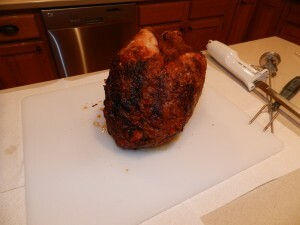 Yesterday as part of our Thanksgiving feast – we did 2 turkeys. 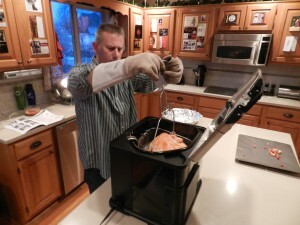 Chris did one in the turkey fryer and I roasted one. 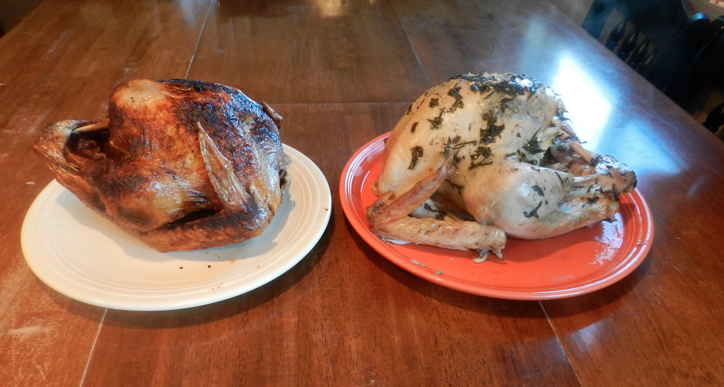 The fried turkey is one the left and the roasted turkey on the right. I told everyone they had to vote for their favorite because everything should be a competition!!! (pretty sure I won – at least in my mind!!!) It might have been a tie because turkey is turkey!!! OK – no more stalling – out to the arctic!!! Hooray for Another Family Day!!! Chris decided to take a day of leave and hang out with us today!!! Yippee! Then he only has to work Thursday and Friday this week – not too bad. I love it when we all hang out together! For my 43 today (Chris said he didn’t stay home to do 43 of anything – weird – I figured he would like this one! ), I wanted to do some type of push-ups. Plyo!!! Jordan likes to do push-up demos usually but today he wasn’t totally into it (too much Christmas, maybe!). I asked him to record me doing a couple – he said only if I still used his video – of course!!! I wasn’t sure if I would be able to do all 43 on my toes or not. I made it!!! I did stop and stretch several times, though. That little jump is no joke!!! Last night, a new friend (one of our neighbor’s daughters – in town for Christmas), text and asked if she could come over this morning to work out. Yes!!! Always fun to have a work-out partner. I pulled out a favorite – Les Mills Combat. Because of the stress fracture and DR rules, I haven’t done this in 3+ weeks – ahhhhh – so great today!!! Erin liked it to. We both got in a great work-out and had fun!!! Our Christmas day was perfect. We had plenty of time to relax and enjoy each other. 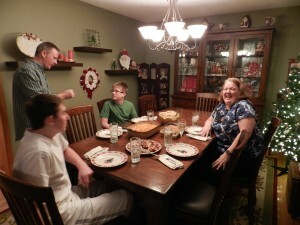 Last night we played games, ate (way too much) and hung out – awesome!!! Everyone had fun at dinner, I think. Good news – plenty of left-overs so I don’t need to cook today!!! More time with my boys!! !